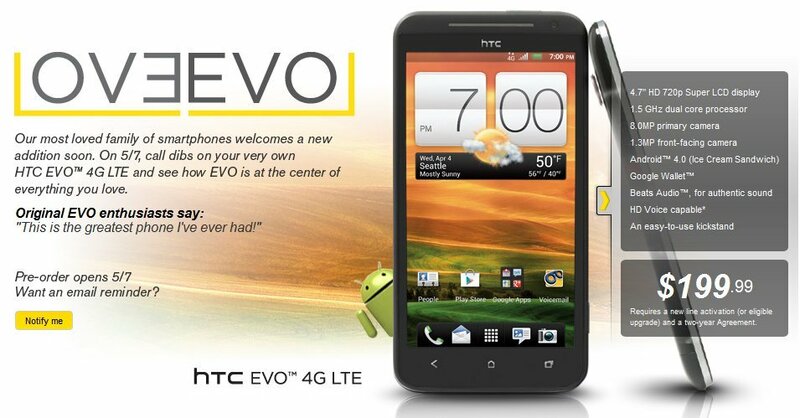 If you're interested in getting your very own HTC EVO 4G LTE (and we can't blame you, it looks like a hot one), you can pre-order one from Sprint on May 7. Checking in at $200 with a two-year agreement, you'll have a phone that Sprint is calling their "new gold standard", and features and specifications like a dual-core S4 CPU, NFC with Google Wallet, and a micro SDcard slot will make just about any Android enthusiast fall in love. We're itching to get one to play with ourselves, and it looks like Sprint has another winner on their hands with the EVO 4G LTE. So, anyone going to be laying down some dollars come May 7?